Facts and information about the Culture of Native Americans including the subject of the Great Spirit. The Great Spirit is the principal, sacred deity of the Native American Indians. The presence Great Spirit is perceived in all aspects of daily life. The Great Spirit symbol shows a depiction known in Western culture as the Eye of Providence represents the eye of God watching over humankind. The Great Spirit is the supreme being and principal deity of Native American Indians. The Great Spirit is the supernatural being conceived as the perfect and all powerful originator and ruler of the universe. The Supreme Being is often defined simply as "God" in Western beliefs and is used with this meaning by many other religions and to refer to different deities. Native American cultures were characterized by an intimate relationship with nature. The Great Spirit was perceived as the divine power that created the world. 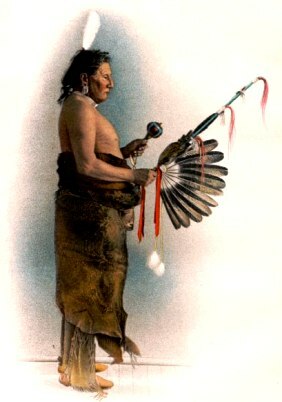 The religious beliefs and practices of the Native Indian tribes included Shamanism, Animism, Totemism, Fetishism and their rituals and ceremonies led by a Shaman, centered around hunting and animals. The creed or doctrine of these belief systems held that intelligent spirits inhabited all natural objects and every object is controlled by its own independent spirit. Spirits inhabit the sky, stars, sun, moon, rivers, lakes, mountains, forests, the animals, insects, fish, stones, flowers and birds. Some spirits are good and help men who please them whereas other spirits are bad and liable to wreck havoc on people and on tribes. Animals, refer to Power Animals, are singled out as powerful manifestations of the supernatural, including those seen in dreams or Vision Quests. Lesser spirits inhabited stones and plants and viewed as 'spirit helpers'. The Native Indian concepts of the Great Spirit varies from tribe to tribe who refer to the Supreme Being by a variety of different names. Some of their beliefs about the Great Spirit are derived from both patriarchal and matriarchal traditions. The Lakota Sioux believe that the Great Spirit is an amalgamation of a dominant Father sky god and Mother Earth. The Great Spirit is seen as both a male and female beings, separate, but part of one divine entity. Other tribes refer to the Great Spirit as "Father", "Old Man" or "Grandfather" and in these cultures the Great Spirit is perceived to be a man, or an animal, with human thought and speech. The Sioux name for the Great Spirit is 'Wakan Tanka' which translates as the Great Mystery and referred to as the "Great Incomprehensibility" The Sioux believed that every object was spirit, or "wakan." Great Spirit. Discover the vast selection of pictures which relate to the History and Culture of Native Americans. The pictures show the clothing, War Paint, weapons and decorations of various Native Indian tribes that can be used as a really useful educational history resource for kids and children of all ages. We have included pictures and videos to accompany the main topic of this section - Great Spirit. The videos enable fast access to the images, paintings and pictures together with information and many historical facts. All of the articles and pages can be accessed via the Native Indian Tribes Index - a great educational resource for kids.